Notes: Designed by Shane Stalcup. Shane was an innovative fly tier out of Boulder, Colorado. He tended to use newer synthetic materials to closely imitate the actual insect. Many of his patterns are very effective. The use of extended wings are usually very difficult on an adult damselfly pattern. 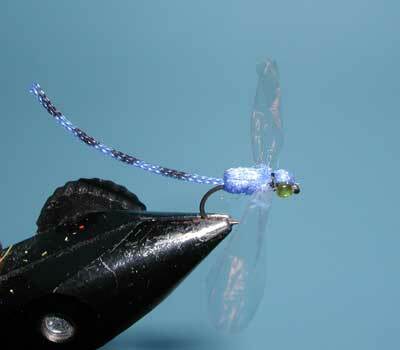 Due to the size, the wings tend to twist the line upon casting, making presentation difficult. Shane used Zing Wing material which is very lightweight and forgiving. Zing Wing is actually Chinese twine used to bind stacks of books. John Bett's discovered the material from a dumpster behind Pier One Imports. Shane marketed a similar product called Medallion Wing Sheeting which comes in a number of colors and he probably used this material on the pattern, presently. Hareline sells a similar product called Clear Wing, and the material can be colored with a marker. Any of these three winging materials will work. Since Damselflies emerge out of the water, they are available to the trout as a dry fly when adults are hovering close to the water and falling onto the surface, usually during late summer. Use a "Chuck and Sit" tactic when fishing stillwater areas with a few twitches every now and then. Blue is the most common color but there are also green damsels. This pattern makes an excellent presentation but should still be used under slow or stillwater conditions.